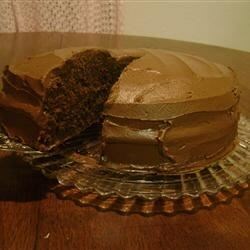 "Two layers of chocolate cake, flavored with rum and coffee, with mocha rum frosting in the middle. Serve with whipped cream and cherries." Preheat oven to 350 degrees F (175 degrees C). Grease and flour 2 - 8 inch pans. Sift together the flour, baking powder, and salt. Set aside. Mix together 4 teaspoons instant coffee, 1/2 cup cocoa powder, and 3/4 cup boiling water; set aside. In a large bowl, cream together the butter and sugar until light and fluffy. Beat in the eggs one at a time, then stir in 1 1/2 teaspoons rum. Mix the milk into cooled cocoa mixture, then beat into the batter alternately with the flour mixture. Pour batter into prepared pans. Bake in the preheated oven for 35 minutes, or until a toothpick inserted into the center of the cake comes out clean. Allow to cool. To make Mocha Chocolate Frosting: Sift together confectioners' sugar and 5 tablespoons cocoa powder; set aside. Dissolve 2 teaspoons instant coffee with 1/3 cup boiling water; set aside. In a medium bowl, cream butter until smooth. Beat in sugar/cocoa mixture. Mix in the vanilla extract and rum. Beat until smooth and creamy. Spread between layers of cooled cake. I made this today and it received thumbs up. It's delicious but very rich, so I skipped the whipped cream and cherries. This is a good recipe, and pretty easy to make. I did add a teaspoon of vinegar to the batter and I think that helped to make it a little more moist. Rich and delicious! Made it for my friend's birthday with a rum-flavoured whipped icing. Huge success! After reading all the "too dry" comments, I added 2 TBSP of chocolate pudding mix to the dry ingredients and two heaping spoonfuls of sour cream. It was PERFECT!!! family and friends loved the cake. i think the cake is a little dry though.